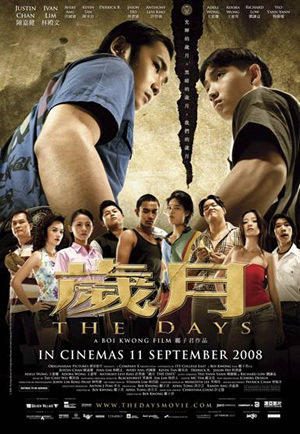 Publicity Stills of "The Days"
Based on a true story, "THE DAYS" tells a cautionary tale between two brothers, set between 1989 and 1990. In a misguided effort to teach BABY independence and to make him feel protected, ZI LONG brings him into his own gang of delinquents. Unknowingly, his decision has thrown them both into a tumultuous and violent world that will, in different ways, imprison them both. We should have known better: A film about street gangs and triads in 1990s Singapore? Given how our friends at the censorship board are always cautiously looking out for media content are unsuitable and unhealthy for our young viewers, how could we think that this movie is all about gangsterism, violence and vulgarities? The latest local movie to hit the big screens after Jack Neo’s Money No Enough 2, Roystan Tan’s 12 Lotus, Lian Pek’s Mad About English and Cheng Ding An’s Kallang Roar The Movie isn’t about monetary issues, getai singers, Mainland Chinese trying to speak English or Singapore’s nostalgic pride that was soccer. It is, however, a movie tied to a social message about the dire and tragic consequences if you choose to join a gang. How else would this film been made, given its gang themes? The 100 minute movie chronicles the paths taken by two brothers as they become part of a gang of delinquents who indulge themselves in all kinds of troubles no parents would approve of. The gang is led by the elder brother who believes that bringing his younger sibling into gang will make him independent and understand what brotherhood and loyalty is all about. Of course, drama in the form of mayhem and chaos happen and lead to a conclusion that any sensible person can predict from the beginning. For those who can remember, Hong Kong had her own signature series of triad movies that was Young and Dangerous starring popular actors like Ekin Cheng, Jordan Chan and Karen Mok. Of course, we wouldn’t want a Singapore production to draw flak film by being condemned by the public for glorifying secret triad societies. So, amidst the scenes of gang fights, bloodsheds and vulgarity spouting, we are always reminded that these activities are not to be promoted and encouraged. The story is based on director Boi Kwang’s personal experience between himself and his younger brother, so you can feel the authenticity in his storytelling. The production values also shine in this movie shot lavishly on High Definition format. The uniquely definitive hairstyles sported by the characters, the colorful hues of fashion labels worn by the gangsters and the nostalgically run down back alleys where petty crimes and fights take place are beautifully brought on screen. The impressive cinematography is complimented by an energetic music score and some very remarkable animation sequences. Alas, all these are not supported by the cast’s letdown performances. Although most of them are first time actors, the delivery of somewhat over romanticized dialogue by these good lookers mar the viewing experience. Things are not any better when you get the feeling that they are trying a little too hard to appear gung ho on screen. Headlining the movie as the two brothers are Justin Chan and Ivan Lim who should do a little more than emote with limited angst ridden expressions. Sure, we get the gist of things about the definitive styles, slang, attitudes and outlooks of gangsters and how there is camaraderie all around, but there is just too much distraction from the cast’s rigid performances.